Orangeville District High School was well represented at CWOSSA during Nordic ski competition with 24 student athletes wearing ODSS colours on the trails at Monora Park on Tuesday, February 13. Nine schools sent both junior and senior competitors to the event with a total of 121 athletes taking part. The Bears team sent 24 skiers to to the regional level competition. The trails at Monora Park are a challenging mix of flat terrain with a lot of hills along the way. The stretch to the finish line is an uphill grade of about 100 meters making the last part of the race a battle to keep a good pace. The junior girls course was 4.2 km in length. Junior boys had 5.2 km course. The senior girls had a 5.2 km course to complete, while the senor boys were up against a grueling 7.5 of ground to cover. “Our region goes from the Bruce Peninsula all the way down to Kitchener,” explained Bears coach and event convenor, Stuart Dennie. There is no qualifier for athletes to compete at the CWOSSA level, however they must have completed other events that will qualify them to compete at this level. Racers are started at 30 seconds during individual competition in the timed event with points also contributing to a team score. After the morning’s individual events, the teams regrouped for an afternoon relay sprint event with teams of four competing in a fast 800 metre sprint before tagging a teammate for the next 800 meters. At the end of competition the Bears finished with outstanding results. The ODSS junior boys team place first overall. The ODSS senior girls team placed first over all. The senior boys ODDS team ended the day with a second place. 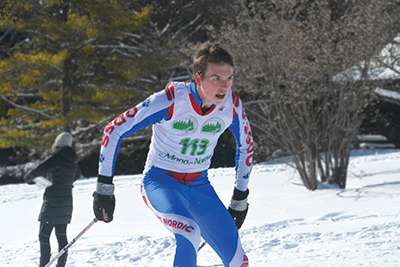 Individual results included eight ODSS skiers who finished in the top three. The team had 17 athletes that qualify through to OFSAA provincials in Sudbury on February 21 – 23.